Uterine factor subfertility is defined as a structural or functional disorder of the uterus that results in reduced fertility. Between one and two percent of in vitro fertilization (IVF) procedures are recorded as being done for uterine factor in the United States as reported by Wright et al. (MMWR Surveill Summ 57:1-23, 2008). Live birth rates for isolated uterine factor are below average compared to other diagnoses for couples undergoing IVF. For example, among women <35 years of age undergoing IVF using their own fresh eggs for embryo transfer, uterine factor has the lowest live birth rate among diagnoses at 35.9% per transfer, which is even below the live birth rate for diminished ovarian reserve (40.3%) as reported by Wright et al. (MMWR Surveill Summ 57:1-23, 2008). Although the proportion of cases of uterine factor that proceed to IVF is small, the resources spent evaluating for and treating uterine factors are disproportionately high. Uterine factors encompass a number of specific pathological entities in an endless variety of presentations and combinations which are not specified by the CDC database. Therefore, counseling couples regarding the contribution of uterine factors to their infertility is challenging. Given these considerations, the best clinical strategy is to screen for the most common uterine factors early during an infertility evaluation. When uterine pathology is encountered, general concepts and statistics for outcomes based upon the specific uterine factors, along with their locations and extent must be accounted for in relation to other infertility factors for a given couple with infertility. This chapter focuses on the evidence for an association of individual acquired uterine factors (endometrial polyps, leiomyomata, adenomyosis, and Asherman syndrome) with infertility. 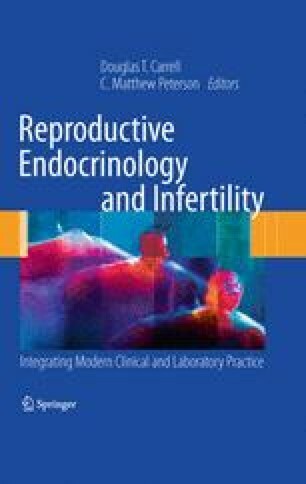 The clinical characterization, pathophysiology, and therapeutic principles for these commonly acquired uterine infertility factors are also reviewed.